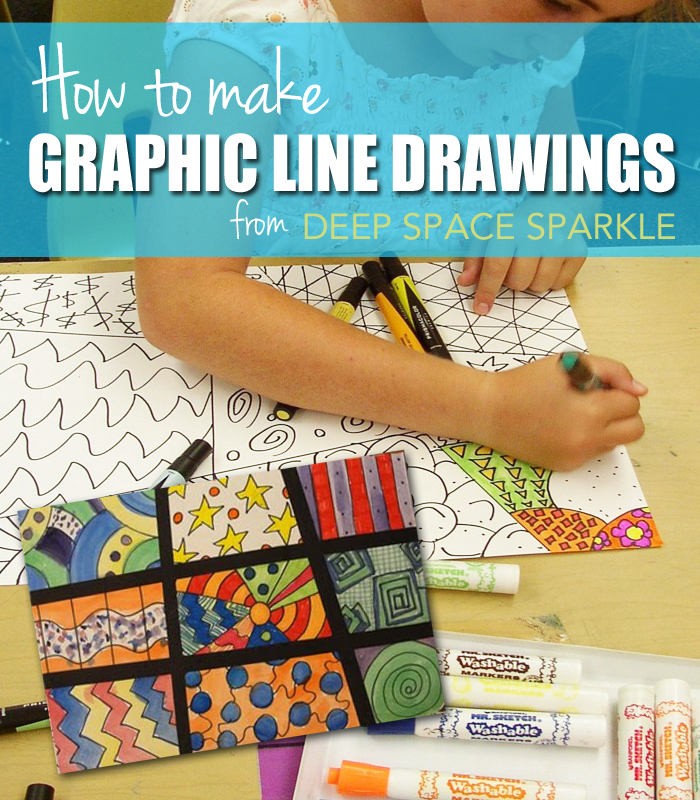 These graphic line illustrations are perfect for fourth grade when many children love to doodle. Instead of leaving the drawings black and white, you can take it a step further and either color in with marker or watercolor paints. It doesn’t really matter how the kids divide up their paper, but I can tell you what’s easiest. Two straight lines across the paper and two lines down. Simple. Of course, some kids will go a bit crazy adding intersecting lines, but they will figure out that this method is limiting. This step can either be fun or frustrating. Many kids will go to town creating their lines and patterns, but many won’t. Ideas will expire after the second square, so be a good Girl Scout and be prepared. 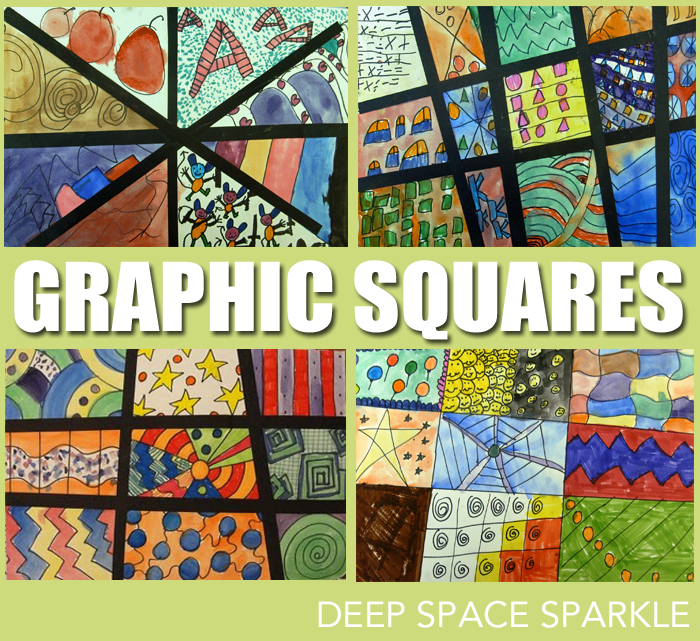 Have a plethora of squiggles and patterns available to them. You can do this in a couple of ways. Either provide them with a handy-dandy handout (obviously this is not my method or it would be included in this post) or run amok and create some of your own patterns on the whiteboard. Brainstorm. Have fun. Create some lousy patterns and some good ones. Need not be perfect. Tip: Use a waterproof black marker. Sharpies are the ideal choice but if such pens aren’t available, use Prismacolor markers. Expensive, but are waterproof. To avoid the waterproof problem all together, don’t use watercolor paints in Step 3. As I mentioned above, you must use a waterproof black marker if you intend to paint the patterns. If you don’t, you will end up with black smears covering the paper. I subjected one such class to this unfortunate blunder, and although the kids were enthusiastic in spirit, I know it caused inner turmoil with my young artists. But let’s face it, using markers is easier and requires less set-up. So dig out your bins of markers and let the kids go at it. 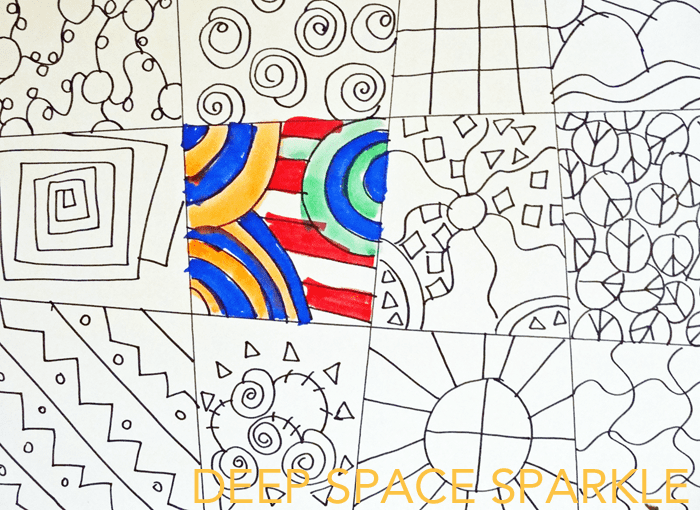 This is a great activity for kids to finish up during “free time” so keep the art accessible. To kick this piece up a notch, add strips of black construction paper along the straight lines. Use a glue stick and make sure the kids snip off the ends. I think it finishes the piece well, but it does take some time. Note: This graphic line art project takes longer to complete than you might expect. I allowed two 45-minute sessions for this project and only 25% finished the entire project. Many kids didn’t want to complete it because it took so much time, so here’s a thought. Cut your paper in half. I used a 12″ x 18″ piece so reduce it to 9″ x 6″ and you’ll increase your productivity. Love this! So simple but so effective. Thanks so much for all the ideas! Another wonderful idea. I think you're right about the black construction paper, it really finishes of the work! Thanks for sharing all the ideas! I just came across your blog last week, I am homeschooler and we are in the middle of an art unit study, and your ideas are a great addition to it! What a great idea. In addition to being stand-alone art, the pages can be laminated for very special placemats or used as wrapping paper for Mother or Dad. After you use the watercolor markers you go over them with water? I have never used watercolor markers and didn't know of such. I know I have watercolor pencils. How do you go over the markers with water without making a mess and smearing all the colors? Brannan: I had a typo. Use waterproof markers, not watercolor markers. Now the post will no doubt make more sense! Yes,thank you for responding. I got it now. I am planning on using this for my 3rd grades to include the element of line. Thanks for the awesome lesson. I love this website!! I’m using this lesson but stepping it up a notch with my Year 6’s by encouraging them to use line and colour carefully to create a different mood or feeling from each section. For example, using jagged lines and reds to create an angry feeling, or flowing lines to create a calm feeling. So far they are looking great. I can’t wait to see them finished! This is such an accessible project, as many on this site are. I’m going to add a lesson on color along with the doodles and ask my class to use primary/secondary/complementary/warm/cool colors in each of their different sections. Hi there, just wanted to say I’m a frustrated artist/primary teacher who finds it really difficult to find inspiring stand-alone art lesson ideas. No more now I’ve found your page! THe skills section is perfect in supporting Scotland’s Art outcomes in Curriculum for Excellence. Thank you!
! I have incorporated Zentangel (doodling) in many of my drawing projects.